The development of the Hudson Commodore Sedan 1948-49 and his Dinky Toys miniature. Hudson had designed an extremely attractive and modern streamlined car for 1948: The step down design. 1947 Typewritten press release sheet on reverse factory photo Hudson Commodore Eight Sedan. As you can read … Hudson Motor Car Company invested $ 16,000,000, in the New Hudson 1948. In 1948 Hudson surprised the car world with his new Step-Down design. In addition to these cars, those of the competition seemed directly old-fashioned. Hudson Factory Plants. Building D is special for the production technique of the Monobilt and Frame construction. (17.000 people at work now … in these huge plants … building the most exciting motor car you’ve ever seen!). As said before: an investment of $ 16,000,000 for the development of this new model. The Hudson Commodore is an automobile which was produced by the Hudson Motor Car Company of Detroit, Michigan between 1941 and 1952. During its time in production, the Commodore was the largest and most luxurious Hudson model. Joseph Lowthian Hudson (October 17, 1846 Newcastle England – July 5, 1912 Worthing England), a.k.a. J. L. Hudson, was the merchant who founded the Hudson’s department store in Detroit, Michigan. Hudson also supplied the seed capital for the establishment, in 1909, of Roy D. Chapin’s automotive venture, which Chapin named the Hudson Motor Car Company in honor of J.L. Hudson. Introduced in December 1947, the Hudson Commodore was one of the first new-design postwar cars made. The 1948 model year inaugurated Hudson's trademarked "Monobuilt" construction or "step-down" automobile. The new models were designed by Frank Spring. The cars had a light, but strong semi-unit body with a perimeter frame. Because of the encircling frame, passengers stepped down into the vehicles. Hudson's step-down design made the body lower than contemporary cars. It offered passengers the safety of being surrounded by the car's chassis with a lower center of gravity. In addition to the added safety of being surrounded by the car's chassis, the step-down also allowed Hudson to gain weight savings provided through unibody construction, making for a well-performing automobile. The cars featured slab-sided bodies with fully integrated fenders. Brougham and sedans were fastbacks while convertibles and coupes were notchbacks. A character line ran from the front to back further lowering the car even more visually, so "the new Hudson looked like a dream car straight from the auto show." 1948 Hudson’s Monobilt Body and Frame – Step-Down design. The streamlined 1948 Hudson stood just 5 feet (=60 inches=152,4 cm) high, which was as much as 5 inches (12,7 cm) lower than most of its contemporaries. In 1948, Commodores came in one series, and were available in either I8 (Super-Eight) or I6 (Super-Six) power. 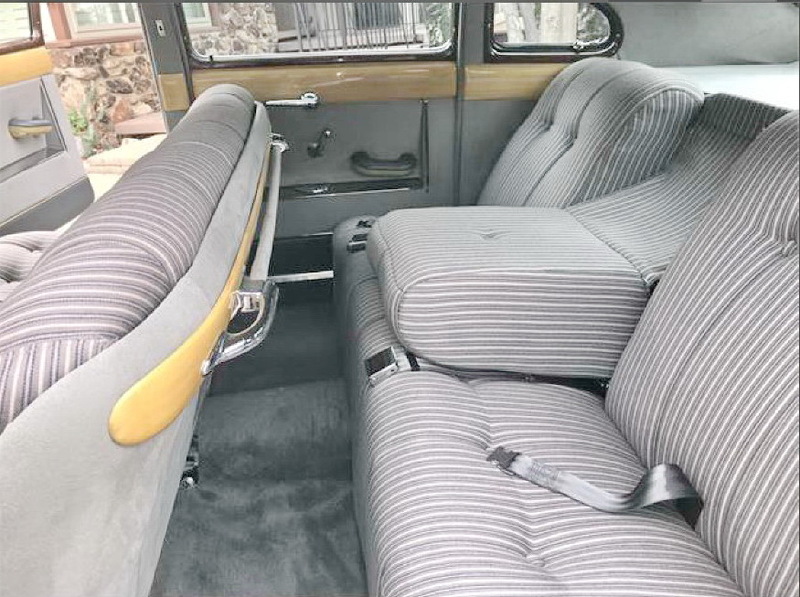 Interiors were upholstered in broadcloth on sedans, leather on convertibles. Again, Hudson continued to provide numerous standard features that other manufacturers classified as upcharge options. Commodore Eight production rose to 35,315 units. 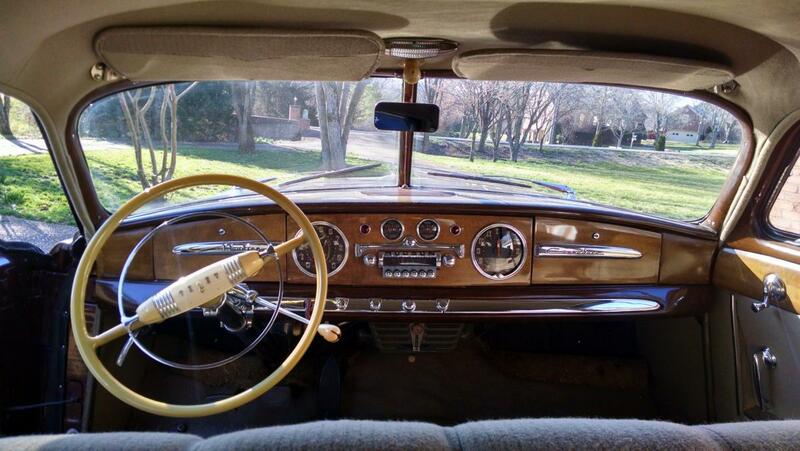 For 1949, the Commodore line was enlarged to include more luxurious Custom models. The Hudson Commodore Eight scored close to 60,000 sales for these two model years, during which no styling or specification changes were made. 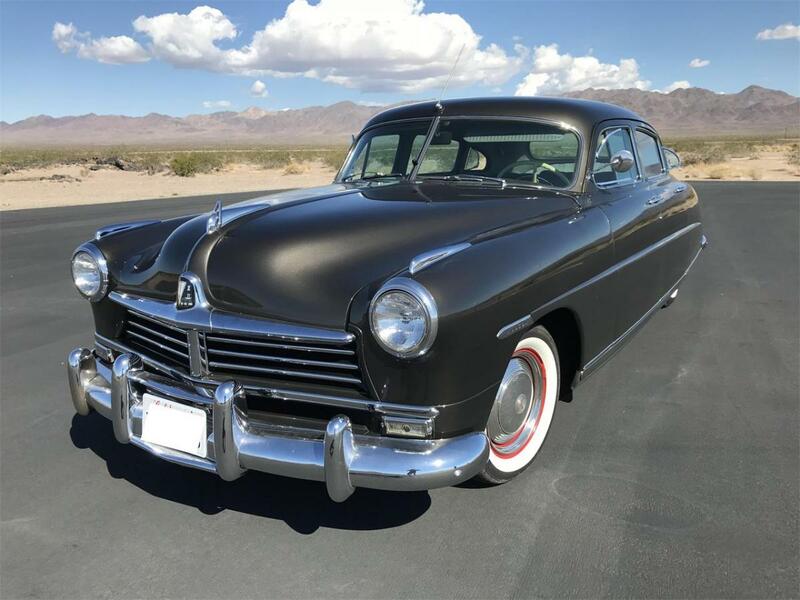 Smooth and ground-hugging in appearance, the 1948-1949 Hudson Commodore Eight was far more roadable than virtually any other full-size American car because of its low center of gravity. As a marketing promotion, Hudson had plastic specialists use scaled-down blueprints to develop transparent models of the Commodore Eight sedan to demonstrate and promote the design and construction of the cars. 1949 - Assembly line of the transparent promotional plastic scale model Hudson Commodore 8 “step-down” and “Monobilt” body and frame. The dies alone cost $ 35,000 and took 4 months to make. Then a small assembly plant was set up. It is understandable that Meccano Liverpool has chosen to reproduce this attractive modern car as one of the first Dinky Toys new post-war US closed passengers cars of the early 50’s. Time has come to leave the dated pre-war re-issues and to produce new post-war models. Practically all re-issues ended in 1950. 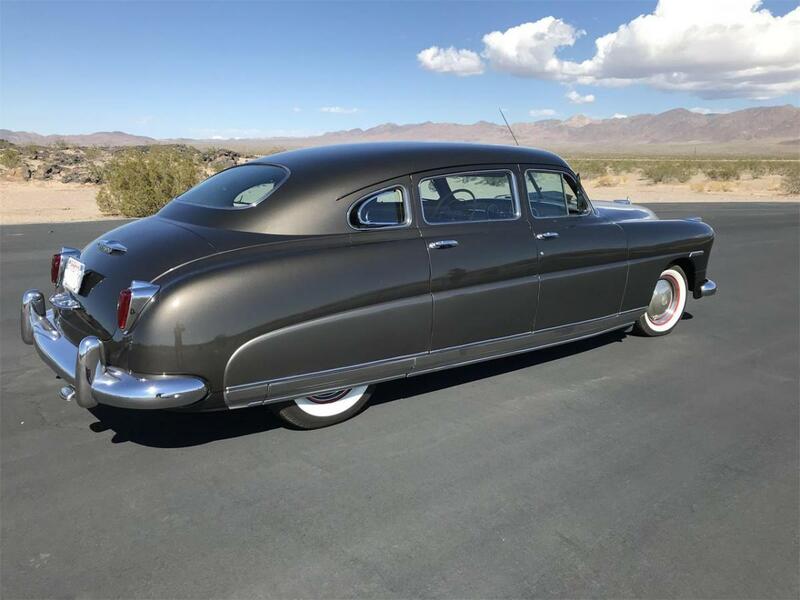 My 174 Hudson Hornet Sedan also from the beginning in two-tone appearance. Description Dinky Toys 139b Hudson Commodore Sedan in MM July 1950 - Super 6 with 121 HP and super 8 with 127 HP. Later Hudson Commodore Sedan 2nd base with large lettering since 15-11-51 (memo GBDT p 218). As far as I know there was never issued a sales number on the baseplate. Note: Nigel Mynheer wrote a very interesting article in model collector 10/2001 about Dinky’s glamorous early 50’s US cars with the title “Dinky’s American dream”. It covers the Ford Fordor Sedan, the Plymouth Estate Car and the Hudson Commodore Sedan. There are various colour and box variations issued of this model. As far as I know there was never a box issued with a Low Line picture on it. Two-tone colour schemes on back page of MM January 1956 with 171 Hudson Commodore Sedan with 2nd two-tone scheme - High Line. Dinky Toys 171 Hudson Commodore Sedan in UK catalogue 1958 with 3rd two-tone scheme - Low Line. 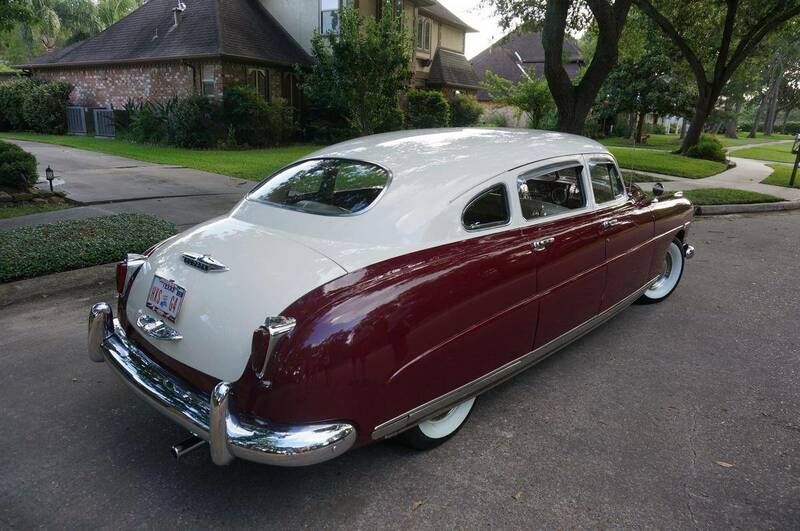 Note: The early Hudson Commodores have a smooth inside roof while the later ones have "Hudson Sedan" cast inside roof. The late models has also highlighted red rear tail lights as pictured below. I found this picture of the Meccano drawing Job No 13240 of het Hudson Sedan dated 28-4-49 on TMT in a contribution of Jan Werner. About this drawing GBDT states: 27.8.57 tyre change and 30.4.59 wheel change. I don’t know what this wheel change means, maybe “spun” wheels ?? I could not find pictures about that. About the base for Hudson Sedan GBDT states: 27.8.52 sales no. added, 8.11.54 sales no. now 171, but as far as I know there was never a sales number on the baseplate. Any opinion about this? As far as I know there were no further casting changes. Finally I show a picture of my 4 early 50's US closed passenger cars made by Meccano Liverpool and some pictures of the real Hudson Commodore in full size. My 4 early 50’s closed US passenger cars. 139a Ford Fordor Sedan; 139b Hudson Commodore Sedan; (139c) 172 Studebaker Land Cruiser; 27f (Plymouth) Estate Car. Regards, Jan Oldenhuis 11 March 2019. Thank you for this fine, elaborate contribution, Jan, of this impressive, very dated model. 1. The early two-tone example which I bought on eBay for the ridiculous price of GBP 4.99! 2. 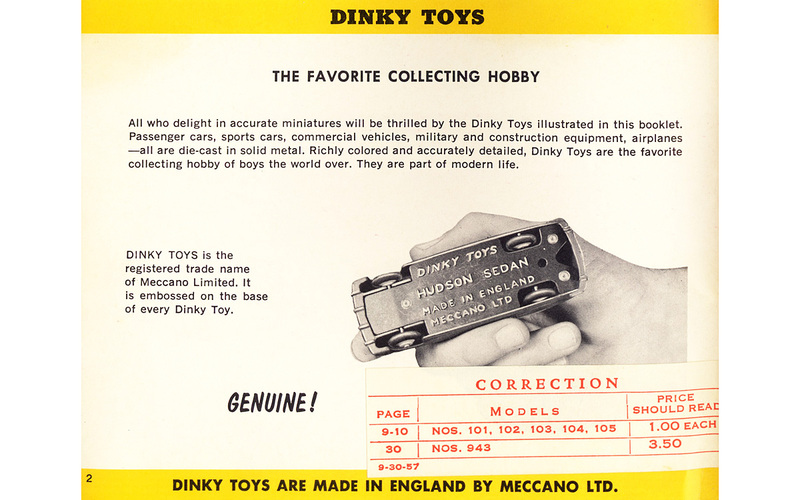 The nice advertisement in the 1957 US catalogue, holding the model in hand and proving the 'genuine' quality of this Dinky model by showing the base plate. I could not resist the temptation to copy this scene myself. 3. The nice 1:1 example on display in the Louwman Museum, Wassenaar/The Hague. Another superb article about a very interesting early post-war American Sedan.....very well researched and presented! I love to see the old, original ads and brochures about these cars....from another era. As a young American boy, I was always drawn to these early 1950’s cars, especially from the so-called independents....Hudson, Nash, Studebaker, Packard, and Kaiser-Frazer.....they were all interesting designs, and I saw them all frequently here in Southern California. Thanks again for sharing this with us! Jan O.Thanks for this comprehensive post. 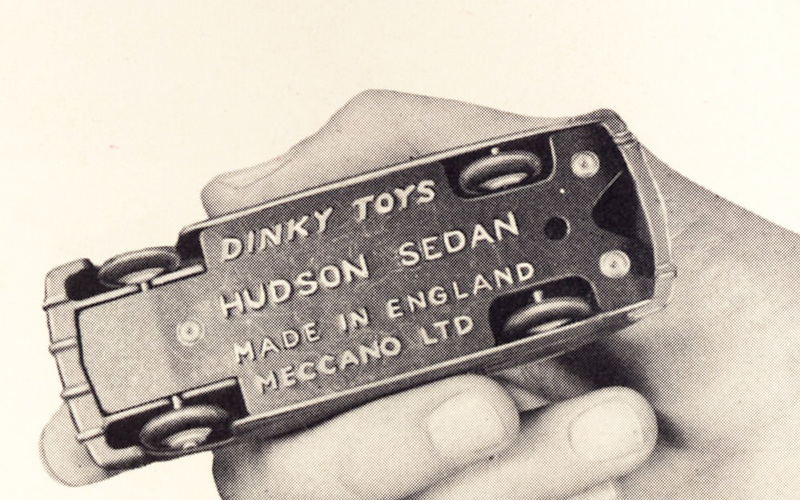 The Dinky Hudson is the model that I have the earliest recollection of as a child. For many years I thought of it as a Hudson Hornet, doubtless because they were so similar, but that confusion persisted until I obtained one and saw the incontrovertible evidence on the baseplate.